My final book is available as of today. Once Upon A Time In America brings The Knight Cycle to a close and will be the last book I have in print for a long time. 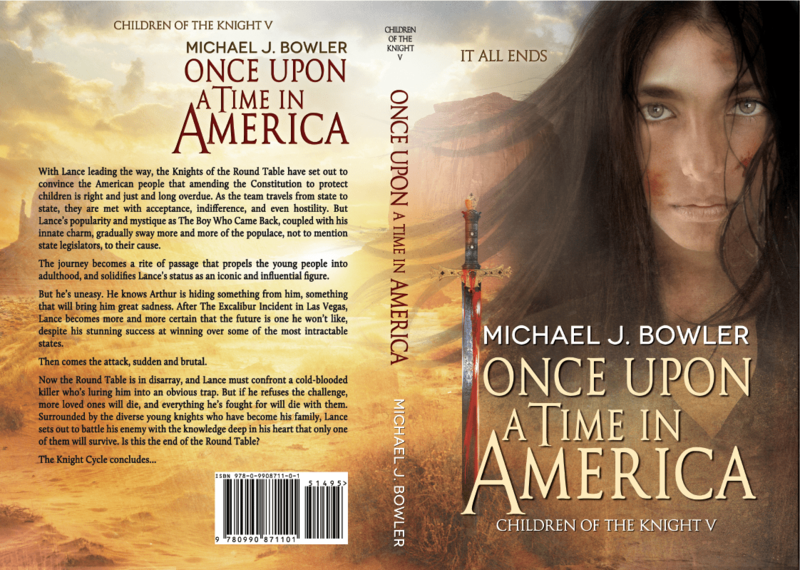 Children of the Knight was never a stand-alone book, but merely the first of five long chapters spanning four eventful years in the lives of my characters and the country as a whole. Once is the chapter that brings the story of Arthur and Lance and the modern-day Knights of the Round Table to a close, and I hope I ended their journey in a way that satisfies readers and engenders within them the feeling that the series was a worthwhile investment of their time. It has been a long, often bittersweet journey for me in the writing and publishing of these books, but in the aggregate I am proud of my accomplishment. I feel I have greatly improved as a writer and the books get better as they go along. I’m proud that this series addresses issues that most writers tend to shy away from. I’m proud of the themes and messages that youth can take away from this story. I’m proud that the series is not another knockout of “insert title of popular YA book here,” but stands on its own as an original, unique “world.” It’s our world of today, but rather than make it worse and dystopian as so many writers do, my story offers hope that the world and America can get better, and that young people are the ones who will make it better. To do so, youth need to ignore much of what they’ve been taught by the media and their elders. They must join together and be the change they want to see. They must accept and embrace their superficial differences and work together as human beings first, everything else second. In banding together in this way, the youth in my series bring about profound and positive changes for the entire country, and are outstanding role models for any teens who read about them. My next blog post will be aimed at those out there who want to be successful authors, especially those who have their first book ready (they think) for publication. I made a lot of mistakes in my attempted journey from writer to author, mistakes I have yet to overcome. Perhaps if I share them with the world at large, other writers will not commit the same errors and will achieve real success. Writing is difficult and lonely, but also very exciting as the world you envision comes to life on the computer screen before your very eyes. However, going from a writer who has written a story to an author with sufficient readers to make all the time and effort worthwhile is an entirely different story, but it’s really the “big picture,” and in my view what separates a writer from an author. Because of my mistakes and the fact that self-promotion is an area in which I have zero ability (sadly, no joke there), I have garnered a mere handful of loyal readers. But they are super-loyal and love my series and I love my readers. And I’m grateful to have them. For those readers, and because I always finish what I start, I completed the series and made it available. It is my hope, of course, that word of mouth might eventually bring more people to the story and then those people will bring even more. Writers write so that readers will read, and hopefully enjoy, their work. I am thrilled that those people who have read all five books greatly enjoyed them and loved journeying with the characters, and I thank everyone who has stuck with me along the way. At present, I have written another novel – a YA horror thriller – that I will shop around. I strongly doubt that it will see the light of day as a published book, but as one of the main themes of my Knight Cycle asserts, hope endures. The writing business is tough. I don’t make claims to being a great writer, but I think I’m a good storyteller. However, my opinion doesn’t count. LOL The marketplace determines the success or failure of any piece of art (I’m greatly stretching the meaning of that word to include my books – Ha! ), so time will tell if The Knight Cycle will ever catch on with the reading public, especially the youth for whom it is intended. My book writing journey ends for the time being alongside the journey of Arthur and Lance. However, I will now, hopefully, write more posts for this blog since Sir Lance tells me he’s lonely all the time. HaHa! The next post will be centered around the mistakes I made on my road to becoming an author and then, who knows? I will, of course, work hard to interest an agent or publisher in my new book and if, by some miracle it gets picked up for publication, I’ll be thrilled and grateful. But I won’t expect that to happen. False expectations in any avenue of life can be deadly. I’ve learned a valuable lesson from the many incarcerated kids I’ve worked with over the decades: hope for the best, but expect the worst. Sadly, that’s how our juvenile justice system works – the worst usually prevails. Success in the highly competitive world of book publishing is so not different. Amazon link to Once Upon A Time In America is below.